It has always been a mean task for every automaker to create from ever-shrinking market categories, a true genuine niche for itself. It is like tapping the hereto untapped crude oil reserve. But wait it’s far better than that. It’s like drilling into a potential oil reservoir which is just half a feet below the ground surface. And guess what follows next, a pool table and lap-dance bar and unlimited happy hours. Audi, beyond a shred of doubt, wants that virgin untapped oil for its own. It’s been drilling incessantly over the last decade, by more than two times increasing its model line-up in a bullish manner to hit the black gold. Rolling out crossover after busting the niche, every one of them is trying to answer the desperate market need, which is untouched and unexploited by others. But here lies that catch, Audi hasn’t found virgin oil for sure but guess what, it has got what it wanted for long, a supreme position in the minds of the Pundits and her customers, and what other beautiful way to do it other than coming out with a machine which has come out on top of the top-of-class Mercedes-CLS. The documents that are accompanied with Audi’s latest offering the A7 sports back, is full of comparison with the automobile which initially was able to fish monopolistically in the BIG COUPE segment. The documents unambiguously claim Audi to be faster, economical, cleaner and going by the statistics, far superior to the Mercedes CLS. Usually car makers refrain from any sort of comparison if their vehicle is sort of off the pace. 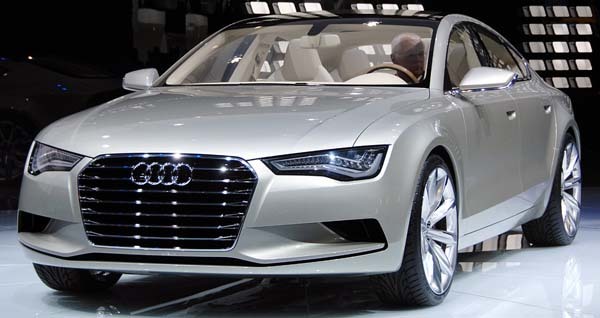 But Audi has declared openly and unequivocally that this is war and the A7 in the shining armor is out for the kill. In this instance the victim is none other than the Mercedes-CLS. All these noise doing the rounds is actually a bit confusing, as A7 is not exactly a competing party to the Mercedes-CLS. The reason for the comparison is simple Audi is a 5 door hatch as against Mercedes-CLS which is a 4 door Coupe-model saloon.. in reality the A7 sports back is similar to A6, what A5 sport back was to A4, a 5 door four-seater. The A6 and A7 sports back do not have a common platform and also they have different body panels. The A6 doesn’t look as sleek and as low as the A7 does. Technically A7 is a four seater, but Audi has announced it will consider a 5 seater provided there is sufficient demand for the same. In CLS where you have sculpted seats in the back, the A7 has a more conventional rear seat. The conversion towards a 5 seater would not take long. If you are an average Joe with height less than 6 feet, the headroom will be enough at the back seats. Audi has been known for making the best of cabins, the A7 is no exception. It has achieved almost parity with the luxury of the A8. The new Audi A7 comes with an option for self parking system, nigh-vision cameras and also has a touch-pad control for varied options of multimedia. These include Satnav Google earth application. This option is an absolute must have if some one else is footing the 3G bill. But it is advised to be aware of flicking and box-ticking through the various options, as the A7 is speculated to be over Rs 1.27 crores. If you have a keenness to know more and are an automobile junkie, you must have for sure noticed that we haven’t even started about the driving part yet. It’s not because it is a street dog- it is not- but because of the fact that it is unremarkable. It is almost next to impossible to provoke the A7 in to some high wire antics, although the torque distribution is a kind of rear-wheel based. The best engine of all is the 245 bhp, 3.0 L diesel out of all the A6 models. One detuned version of the S4’s engine is also available but it does not arouse enough to justify the premium it commands. The A7 is grippy and fast, but at the same time is not all fun to drive, as you may want it to be. The main job for what the A7 is meant for-accommodating a family of four in great comfort loaded with hi-tech stuff-it is brilliant. At least, you can say till the next year, when the new CLS is due. To sign off by saying that A7 has all the beating in the entire department for our good old Mercedes-CLS.